By crossing the longitude of South East Cape, the southernmost tip Tasmania, at 08:39 GMT this Saturday, December 12, 2015, Spindrift 2 set a new record time for crossing the Indian Ocean (Cape Agulhas-Tasmania in 8 days 4 hours and 35 minutes) but more importantly for the passage between Ushant and the entrance into the Pacific: 20 days 04 hours and 37 minutes, which is 2 hours and 34 minutes better than the holder of the Jules Verne Trophy. But what awaits them in the largest ocean on the planet looks quite difficult to decipher. The black and gold trimaran is still approximately 25 miles behind on the virtual road against Banque Populaire V in 2011, which is the effect of the more northerly position of Dona Bertarelli, Yann Guichard and their twelve teammates. In effect, it is like a fresh start at the entrance of the Pacific, especially as Francis Joyon and his crew are also in the hunt, 60 miles to the west, and about four hours behind the record time. That is a drop in the ocean in terms of the distance remaining to get back to Ushant: 11,700 miles (21,670km). Both contenders are hot on the heels of the holder of the Jules Verne Trophy and it is almost like a new starting signal was given under Tasmania, almost at the halfway point of this round-the-world voyage. 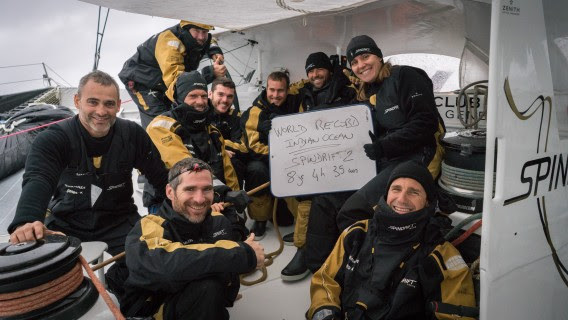 And though Spindrift 2 will only hold the official WSSRC record for crossing the Indian Ocean in 8 days 04 hours and 35 minutes for a few hours (which its pursuer actually should improve in about two hours), it has been the fastest since Ushant, taking 20 days 04h hours and 37 minutes to reach the Pacific. Some traps lie ahead in the Pacific after New Zealand, that the giant trimaran should pass within approximately 36 hours (overnight from Sunday to Monday): an area of low wind will slow its progress early next week and maybe force it to go round a polar anticyclone. But this should not damage the chances of improving the Jules Verne Trophy record time as the holder in 2011 also struggled to cross this ocean.